Many of you will be aware of Adam Bartlett’s chant compositions for the Propers of the Mass in the vernacular. They are in the Lumen Christi Missal and the Lumen Christi Simple Gradual, both available through his publishing house, Illuminare Publications. 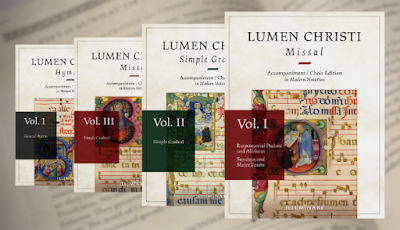 In addition, there is the Lumen Christi Hymnal, which has a selection of traditional hymns for liturgical and devotional use, and the proper hymns of the Liturgy of the Hours translated into English and set to the ancient melodies. He has now published accompaniment editions for this material. For example, there are four part arrangements that can be played by organ or sung as SATB for choir, given for the chants of the Propers or the Responsorial Psalms. I became aware of Adam’s music when I joined a choir in New Hampshire some years ago. We were a mixture of adults and children with varying degrees of experience of chant. We found that Adam’s chanted Propers were relatively easy to sing, allowed for a clear articulation of the text so that the congregations can understand it. Also, the priest was very excited by them, as he told me that to his pleasure and surprise the congregations were enjoy them and beginning to sing along. Each Bartlett chant is modal and composed in the same mode as the Latin Proper from which it was translated. This means that they connect musically with original Latin propers. Therefore, when we sang the Latin after the English as a meditation, we found that congregations accepted them, and could thus be introduced to the Latin without being intimidated by texts they don’t understand. I look forward to hearing these!